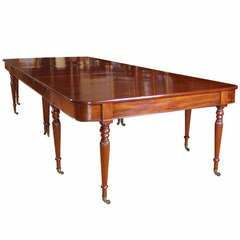 An American tripartite banquet table in the Hepplewhite manner, bench-made in 1880 for the German Embassy in Washington D.C. Handcrafted Honduran mahogany on tapering corner-fluted legs. 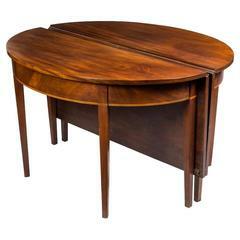 184 inches long, 48 inches wide, with 30 1/4 inch table-top height; seating up to 16. 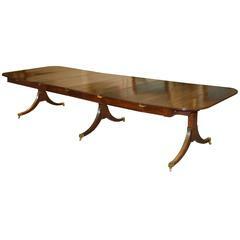 With its four leaves down and its two original 48 inch gap rails inserted, length is reduced to 80 inches; seating eight. 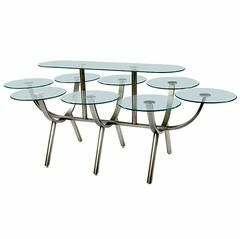 This three part dining table, with its four swing-legs supporting its drop-leaves, may be configured as two separate tables; the larger seating ten and the smaller centre section seating eight. 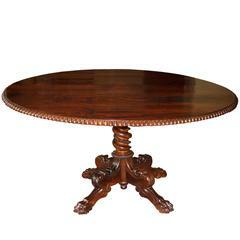 The Philadelphia Exposition of 1876, in celebration of the American Centennial, revived interest in furniture that was made and prevalent in our country one hundred years earlier. Fine, sturdy antique condition; immediately serviceable on delivery.